O glorious apostle, SAINT JUDE THADDEUS, true relative of Jesus and Mary, I salute you through the most Sacred Heart of Jesus! Through this Heart I praise and thank God for all the graces He has bestowed upon you. Humbly prostrate before you, I implore you through this Heart to look down upon me with compassion. Oh, despise not my poor prayer; let not my trust be confounded! To you God has granted the privilege of aiding mankind in the most desperate cases. Oh, come to my aid that I may praise the mercies of God! All my life I will be grateful to you and will be your faithful client until I can thank you in heaven. Amen. "Blessed Apostle, with confidence we invoke you!" 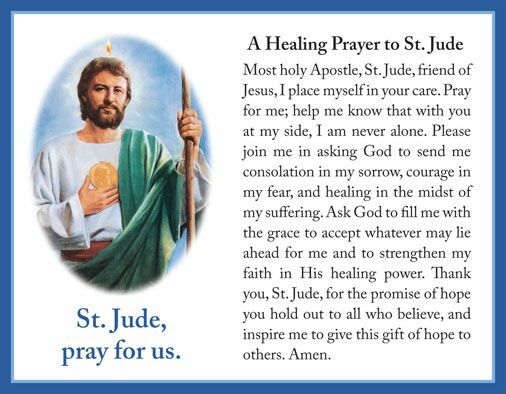 "St. Jude, help of the hopeless, aid me in my distress." PRAY FOR US that we before death may expiate all our sins by sincere repentance and the worthy reception of the holy Sacraments. Pray for us that we may appease the Divine Justice and obtain a favorable judgment. Pray for us that we may be admitted into the company of the blessed to rejoice in the presence of our God forever. Saint Jude, glorious apostle, faithful servant and friend of Jesus, the name of the traitor has caused you to be forgotten by many. But the Church honors and invokes you universally as the patron of difficult and desperate cases. Pray for me who am so miserable. Make use, I implore you, of that particular privilege accorded to you to bring visible and speedy help where help was almost despaired of. Come to my assistance in this great need that I may receive the consolation and help of heaven in all my necessities, tribulations and sufferings, particularly — (here make your request) — and that I may bless God with you and all the elect throughout all eternity. I promise you, O blessed JUDE, to be ever mindful of this great favor, and I will never cease to honor you as my special and powerful patron and do all in my power to encourage devotion to you. Amen.